When my husband first announced he was going to India for two weeks I had two thoughts: 1) I’m going to miss him terribly 2) Whooohoo!! I get to make recipes with cream cheese. I immediately thought to bake a cream cheese recipe that I hadn’t made in years: Zebra Brownies. This recipe has been in my family since I was a little girl. The recipe card says that my mother found this recipe in the Omaha World Herald newspaper. For you young kids, a newspaper is an ancient artifact that prints news articles on actual paper. Do people still read ‘newspapers’? I digress. I fondly recollect crafting these brownies for the first time when I was 9 or 10 years old. Never a fan of plain chocolate brownies, my discriminating tastes as a youngster would always prefer multiple dimensions of flavor verses the mono-flavoring that is found in plain chocolate brownies. I was drawn to this recipe because it embodied brownie uniqueness with two distinct layers. Standing on my tippy-toes as a young girl I would use a hand mixer to mix both layers of the brownies in two separate bowls. After pouring the white layer on top of the brown layer, I was careful to swirl both layers together to make an elaborate zebra print within the brownie. I remember my mother was particularly impressed with my swirling skills. She had never seen zebra brownies that had been swirled so perfectly. Cheering on her little chef my mom continually sang my praises in the kitchen. My ambition to cook in my youth was often to impress my mother and father and to make them proud. I owe so much of my passion for cooking to their continual encouragement. It's not only fond childhood memories that are attached to these Zebra Brownies, but they taste amazing too. 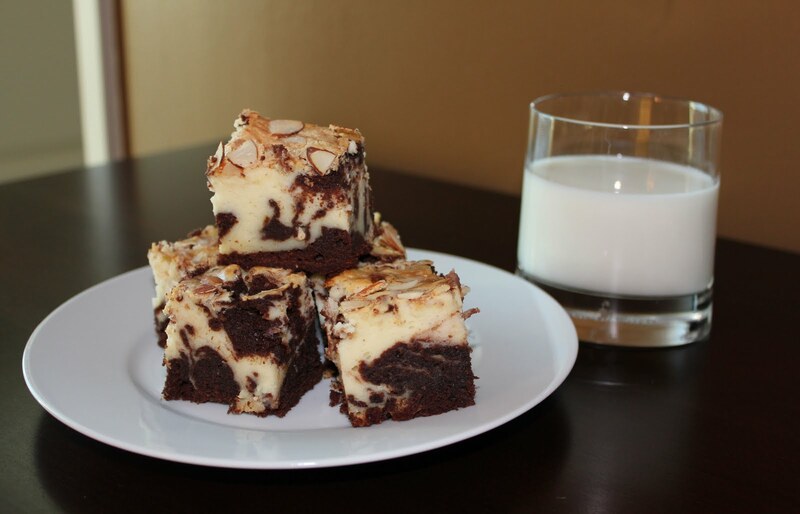 Zebra brownies have a bottom layer of decadent chocolate, and then a top layer with a cream cheese base. You add almost a dozen eggs when you cook the brownies so they rise in the oven and become fluffy. What I like most about this recipe is that they're easy to make and always a hit when you bring them to a party. I made the brownies on my birthday this year and shared with the Atlanta Food Bloggers’ Alliance at our dinner meeting. Sprinkle sugar and sliced almonds. For bottom layer, cream together softened butter and sugar on high speed. Add cocoa, eggs and vanilla. Mix in flour. Pour in 9X13 pan. In a separate bowl, cream together cream cheese and sugar. Add eggs, vanilla and flour. Put in pan on top of the bottom layer. Take a spoon or spatula and swirl so the two colors mix. Sprinkle top with sugar and sliced almonds. Cook for 50 minutes or until brown on top and knife comes out clean.